It had taken two days to prepare the food for a lens-based show several us had curated back when we were graduate students at JFKU. Curating a show is the only way to learn the art business and there are myriad mistakes to be made in the process. The first mistake of my fledgling career was to put the food in a separate, secluded room away from the artwork. You want people to mingle amongst the art, not somewhere else. Worse than that, I'd forgotten about the Shrimp People. I'd carefully displayed the food and gone back into the gallery to meet the arriving guests. Ten minutes later I returned to a half-empty buffet table. This seemed impossible. There were only a half-dozen people at the show. Someone was stuffing our food into invisible containers. No way could they be eating so much, so fast. The Shrimp People. These are the people that crowd you out at the shrimp-cocktail table. They have elbows of steel and the greased arm of a gunslinger. The hand is faster than the eye and these people can swallow shrimp like a bird eats a worm. We had about a half dozen Shrimp People that hung around the JFKU Berkeley gallery on show nights. They were ruthless. Though we had no shrimp at our modest show, they'd absconded a whole frittata, several wheels of cheese, and a bucket of meatballs. You can tell a lot about a person while he's at a buffet. Since I've done some catering and owned a cooking school, it's a hobby of mine to study buffet behavior. I was recently at a charity event where a consultant to a non-profit organization had found his way to the buffet table before anyone else. He'd eaten five plates of goodies before the second wave had arrived. "This is a great opportunity for us to have this event at this lovely venue," I heard him say with his mouth full of shrimp—the shrimp always reveal these people. He almost choked on a tail before he got to the end of his sentence. There was barely time for him to chew between plate rotations and breathe at the same time. His eyes darted around large expanse the food was displayed. He plucked a meatball with a toothpick in mid-sentence. He kept talking while he stuffed it in his mouth in one, fluid motion. I looked away, unable to watch him eat anymore. Though the food looked fabulous, I admonished myself not to overeat that night. I also figured it would be hard to trust a consultant whose first task was to eat most of the shrimp his client had set out for guests. Forget about lie detectors. A buffet table will tell you more about character than most anything else. Today's featured photo is decidedly not of a Shrimp Person. 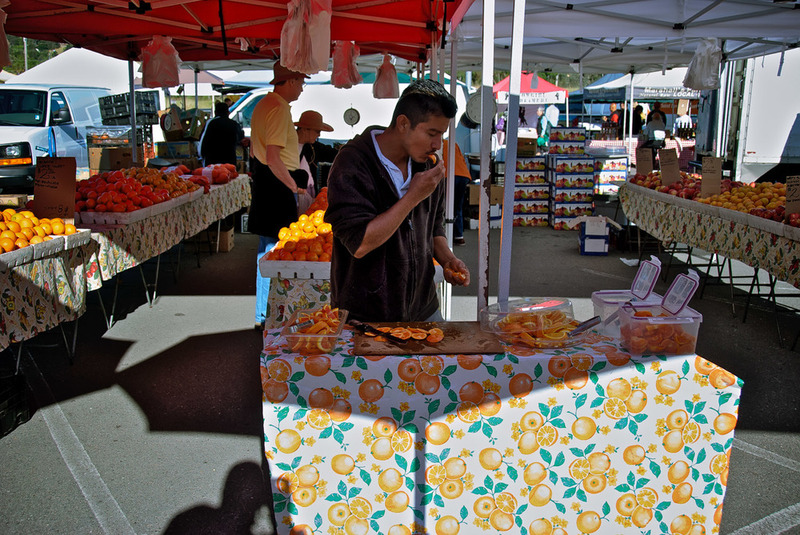 It's simply a lighthearted moment where an employee eats an orange sample at the farmer's market. I don't blame him. The oranges were irresistibly sweet and juicy. After I made the photo I walked over and tried one myself. Thinking of the Shrimp People, I reminded myself to eat just one.